Super Savvy Mommy: Show and Tell Time--I've Got the Most Stylish Kid! Show and Tell Time--I've Got the Most Stylish Kid! Dapper Dexter, Dashing Dexter. No matter how you say it, it all means the same. My kid is pimpin'! For a 13 month old he sure has style. His favorite name brands are The Children's Place, The Gap and Ralph Lauren. My biggest vice involves shopping for and outfitting Dexter. It is an obsession. This kid has more pairs of shoes than most grown women that I know. He may only be slightly over a year old but his fashion sense is wise beyond his year. If you would like your child to be as stylish as Dexter then you can head over to The Children's Place (TCP) because they are having a really nice sale! Because slideshows are sometimes not compatible with everyone's computers, I wanted to make sure that everyone could enjoy the full effect of this Fashion Show. So I elected to do a photo spread.....enjoy! OMG, the Easter outfit wins, hands down!! Tatum says, "Bow chicka wow wow!!" He is the cutest! I have to pick just one???? I guess I will have to say the Easter one too! The fall photo with Dexter wearing the orange polo and khakis is beautiful. It is a very natural everyday look. He is a handsome little man! 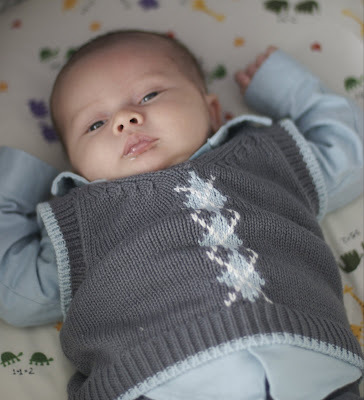 Ok the tiny D baby argyle and the hoody pic above it are my faves. I love the Easter one but these two really really caught my eye! I LOVE them all! I would say my favorite is the last picture, his Easter pic! That outfit is so cute and sophisticated for a child's outfit. Dexter sure knows how to rock it! My vote is for the t shirt and shorts outfit. Dexter is holding his new pair of shoes. I think Ella sent this to him for his first Birthday. I also love the TCP quality of clothes, I have never been disappointed. I liked the brown plaid shorts with the cream t-shirt. hard to pick... SO HARD!! Its between the Xmas and the Easter one!! He is gorgeous!! Polo shirts - I love me some polo shirts on a little boy! (and on a man too...but that's another story). Your son is so cute! My favorite is the long sleeve orange outfit outside in the leaves. It goes perfect with the fall season. Big D is so chic! I love them all, but Scarlett is partial to the shirtless shot in the Hawaiian shorts. She's imagining long walks at sunset with her soul mate! Hubba hubba! Dexter is absolutely the cutest child! He personality just shines through his photos. What a special boy. As you can see he is very versatile...Hawaii... Little Man...Sportster.. he is a natural. That boy is super fly! I love the grey pants and the argyle sweater vest outfit. So adorable! He is so adorable. I love them all expecially the easter pic. One picture says it all.. He's the man. = ) Adorable! Love the Easter pic. He is too cute!! He's such a cutie!! I love his Easter pics. Great blog. You have a great looking lil man! He is super adorable! Very cute Easter Pics! He is such a cutie! Dexter has always been stylish. I love every one of the pictures but I'd have to say the one with him laying down in his little suite is by far the cutest of this bunch. I like the picture with the plaid shorts, he is a QT! Ohhh, Dexter is such a cutie pie. I like the Easter picture best. Super cute! I like the one in the grass where he is crawling towards you. What a stylin' little man!!! You are right, Dapper he is. His shoes are even amazing. I love the Easter picture the best but my 3 year old daughter Mylee says "he is cute close up!" Dexter is so handsome! I LOVE the pic of him in this years Easter outfit. OMG he's such a cutie, Love the pics! Dexter is soooo adorable! I really like the one of him in the royal blue polo. What a cutie with such a fashion sence. I love them all!!!!! Love the outfits...all of them! What a dapper young fellah! He is a little doll.All the pics are adorable! Ilove the one of him in the orange shirt sitting in the leaves! He's so cute!! Good luck Maggie! Oh sweetness! So adorable. I like the very first picture. Born Naughty. You little man in the cutest thing ever! I love his birthday shirt! What a handsome little man you got there. OMG I love the one of him in the born naughty shirt. Too cute! Dexter is such a handsome little guy. I love the one of him the hoodie that is close up. He always has great outfits on and he always looks so cute. I also love the Easter one. My favorite is the one with the red sweater vest. How adorable! Omg! All are so adorable!!! Aww I love the Easter pic!! I love the sweater vest when he was little. What a handsome baby! He has to be one of the best dressed babies EVER! What a cutie! Keep up the good work! Stylin' little man you have there! Dexter looks great in everything! Aww what a little ham you have there. He is so cute in his swimming trunks holding the water bottle as if to say "lets go to the beach mom". "I'm The Man" Says it all. What a handsome fella. Look at the li'l pimp in his sleeper and hat. So cute! Too funny! Look at him trying to decide which pair of shoes he wants to wear. Look at Dex styling and profiling my little man is jealous. Good Luck Momma and Dex. I can't wait to see the new outfits you will get. I love the Easter pic! I think my favorite is the one of him playing in the leaves. It's so hard to choose though. I love the close up of him crawling in the grass with his hoody on. Adorable! He is adorable in all of the pics! The Easter one is my favorite! I love the skull blanket or whatever he was laying on. It was ADORABLE!! He is such a cute kid! we love the childrens place too! What an adorable little man! Aww he is a cutie! Isn't he a slice of heaven!? I LOVE the leaves one! What a little HAM! Closeup pic is so cute. I can't pic just one picture. First pic, he looks like he is relaxing! What a handsome little man!!!! Love the first newborn pic. You've got an adorable little guy there. He's too freaking cute. good luck with the contest! Dexter is one dapper dude!! 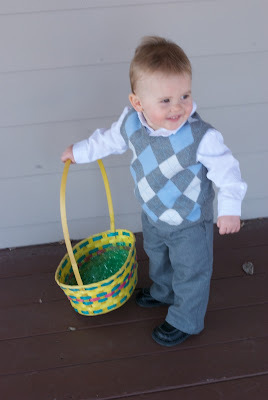 He is super, super cute in all the outfits but if I had to choose one it would have to be the pimpin easter outfit!! You look like you have your work cut out for you! Dapper Dexter is rockin that "Born Naughty" shirt! aww he is so styling!!! Aww! I'm lovin the one of him in the leaves. OMGoodness, What a cutie! I'm jealous of all his stylin' clothes. My favourite is definitely the last one with the gray vest! Dexter is just too darn cute! I love his big brown eyes! What a cutie! I love the I'm the Man picture!!! He must love his Orange Veggies!!! My daughter did and this just makes me laugh!! That little orange nose is the tell tale sign!! I just get such a kick out of that!!! I love the fall leaves pic. I have a similar one of my daughter and it is a fave. Great clothes too! what a handsome guy! and I love the last one in his argyle sweater church outfit. so cute. He's to cute I love the fall pic! What a handsome little prince he is!! Dexter! I love your easter outfit! What a stylish little man you have! I love argyle, so I have to say both of the argyle sweater vests are adorable! I love his naughty pic! He is adorable!! I like his fall pictures!! What a sweetheart! I love the one in the leaves!! He is so adorable! Good job momma! I really like his profile shot! i love the one where he's outside in a blue hoodie!! he's way too cute!! 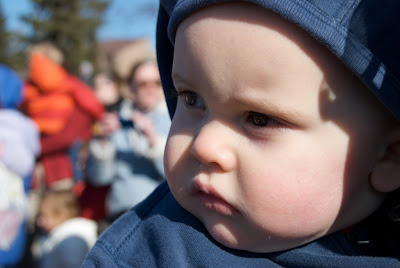 What an adorable little boy! Girls will be drooling over him! Such a cutie!! Love the close up shot (2nd to end) with his hoodie on, too adorable! I love Dex in the I'm the man shirt. He is such a stylin little dude! Yup it's the little nose that gets me every time! He is adorable. I have 2 girls and I just love boys! He is very stylin'! So cute. We love TCP as well. aww he is such a heart warming babe! I love his easter outfit! Awww...I dressed my oldest in all those cute clothes...loved all the baby Polo stuff...then I had number 2...he gets the hand me downs or Target!! LOL!!! You little man is a cutie pie!!! love the orange autumn leaves!!! What a handsome guy in the orange shirt. He looks like he has alot of opinions on things. What a doll he is! My favorite one is the very first one. So sweet! He is adorable in all the pictures, but if I had to pick just one, I would pick the close up of his face in the second to last shot. I just love the one of him as an infant, in a dress shirt and sweater vest... that's priceless! I love the hibiscus bathing suit. Too, too cute. I love his pic with his I'm the Man shirt! So cute! He has the greatest smile! I like the cable knit vest with the diamond pattern, but they are all so cute. I'm digging the swim trunks. :-) Oftentimes, The Children's Place will also have give aways at the time of checking out in their store (socks, stuffed animals, etc.). The clothing is also decent quality and fair prices, too! I have two favorites - the second from top and the second from bottom! My favorite is the last pic. Dexter is so adorable!